A British company has come up with a camera that surprisingly enough, goes against all things prude in Britain. 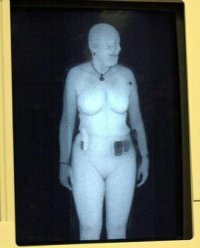 This unique camera has the special ability to detect various items such as weapons, drugs and even explosives hidden under one’s clothes from up to 25 meters away, making this a potential breakthrough where the security industry is concerned. Dubbed the T5000 camera from ThruVision, it utilizes “passive imaging technology” that helps identify objects via their natural electromagnetic rays, also known as Terahertz or T-rays which are emitted. This high-powered camera boasts the ability to detect hidden objects from up to 80 feet away, and can work just fine even when people are moving. For those who are extremely shy about their bodies and scream about privacy rights, rest assured – it won’t be able to reveal physical body details while the entire screening process is harmless. It is inevitable that this technology will see action on both the military and civilian fronts, being used in places like crowded airports, shopping malls and sporting events. Since everyone and all objects emit low levels of electromagnetic radiation, this camera will be able to pick up all and sundry on a person. Depending on the type of material, they will feature different wave signatures, enabling surveillance officers to tell the difference between a block of clay and cocaine, or a knife and a bunch of keys. Anything to make the world a safer place I guess. This is old news. We’ve had this for a few years now. So why are you showing a millimeter-ray picture which DOES show anatomical details, unlike the passive terrahertz system. I can just see the potential to abuse this system already. Council workers have already been arrested for using street cameras to spy on women in their own homes. What makes you think that the people who operate these cameras will be under strict control?